On Thursday, March 24th, Dr. Emma Cunliffe from UBC’s Faculty of Law led us in a fascinating discussion around evidence law and how feminism can help us re-conceptualize the law of evidence. The discussion starting with thought-provoking questions around the Rhodes case (more widely known as the “Justice Dewar Decision”): what knowledge gets into the justice system? How? And once its in, how does it get negotiated? While evidence can be simply understood as a system of law with a set of rules, Dr. Cunliffe challenged us to think of evidence as proof, or more specifically, the logic, rationality and sources of information judges use in coming to their decisions. Too often, law students take findings of fact as just that – fact. But where does this information come from? Who does it exclude? And what does a court do with it? These questions are sometimes neglected as we learn the rules and tests that make up the substantive learning of evidence law, but they are important questions to interrogate as we consider how law is made, and on what terms. Dr. Cunliffe noted that feminism has quite famously influenced rules of evidence, with one example being the Lavallee case. But as our discussion showed, feminism can also help us understand knowledge and the politics of knowledge. An example here is the work that feminists have done in Canada to enlarge the concept of reasonableness through the use of expert evidence. Yet the very notion of reasonableness leads to questions of common sense. Our discussion pondered what common sense means in law and the impact that it has on the trier of fact, while recognizing that there must be some notion of common sense in our legal system to ensure functionality. But common sense can also be equated with stereotypes. The point was raised that common sense notions of what makes a witness believable often fails to account for cultural differences, an example being that in some cultures it is rude to look people directly in the eye, but in Western society, this is thought to make someone look “shifty” or untrustworthy. What feminism and substantive equality demand is that we challenge what is reasonable and rational at the point where inferences are drawn in decision making. This means that we must question the operation of common sense, even in places where it is not always visible. With these ideas in mind, our discussion turned to the work Dr. Cunliffe has done on mothers who have been wrongly convicted of killing their children. The question here is if these cases have informed our understanding of what can go wrong in the same way that other miscarriages of justice have. It appears that the cases of wrongly convicted mothers are often chalked up to one “rogue” expert (a Charles Smith, or other equivalent), but this reasoning fails to account for how knowledge is used in this trials. Often, stereotypical reasoning is drawn upon by these experts, and these things make sense to a jury. They are common sense. They draw on stereotypical understandings of families. Feminism can operate here to enlarge our sense of how people behave and what is reasonable. The discussion wrapped up with many important questions. In particular, we questioned the role of science. Where social framework evidence can be useful in expanding notions of reasonableness, it is considered “soft” science and less credence may be given. However, forensic science is often considered infallible, even where it is not. While judges are often not skeptical enough, some of the fault falls to lawyers to. After all, lawyers are also situated within their own sociological contexts, and more likely than not, will engage in their own processes of inference and reasoning as they determine what information is important and relevant to a case. Our role in how knowledge enters the legal system is a crucial one. The roundtable with Dr. Cunliffe helped highlight the need to not just learn and understand the substantive law in our doctrinal courses, but to go further and question and challenge it. *Dayna Steinfeld is exactly 3 weeks from being done her second year of law at Robson Hall. Not that she’s counting. As co-chair of the FLF for this academic year, she was thrilled to wrap up the year with such a stimulating discussion. 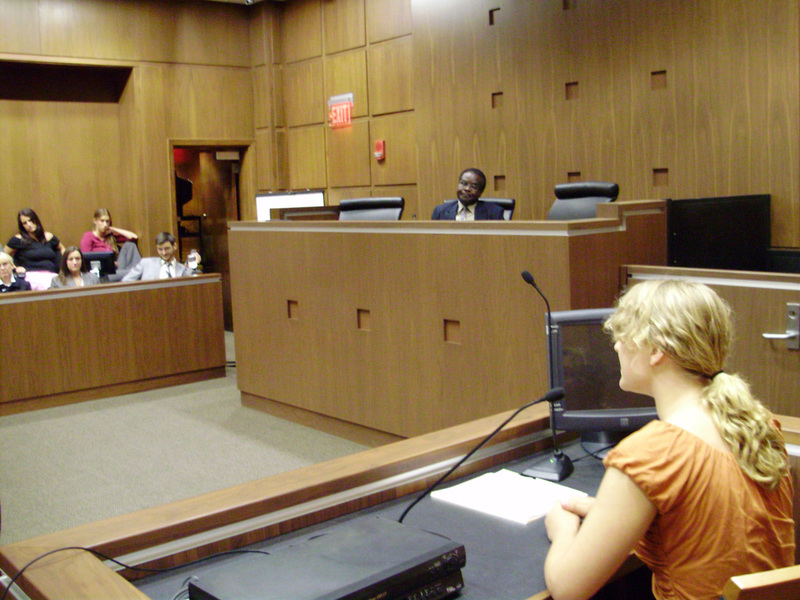 Are female lawyers and law students speaking up? The IWD march on Tuesday was fantastic. There was a big, loud and proud crowd marching down Broadway and Memorial – and many shouts and honks of support from vehicles passing by. There were placards demanding justice for missing and murdered Aboriginal women and for Sisters in Spirit. 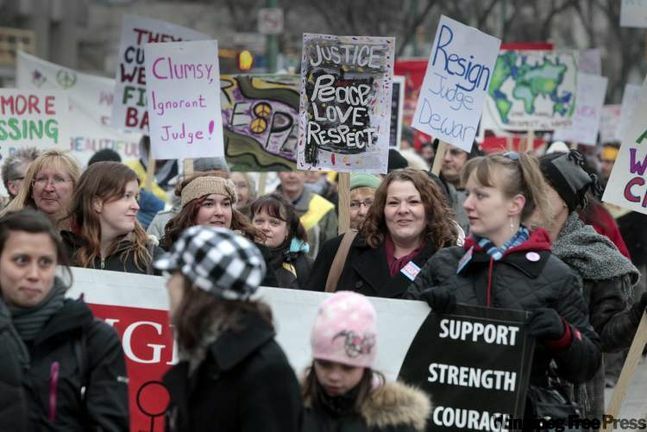 There were signs decrying Harper’s regressive stance on women and equality. There were signs shouting “My miniskirt does not equal consent!” The radical cheerleaders kept the chants going throughout. 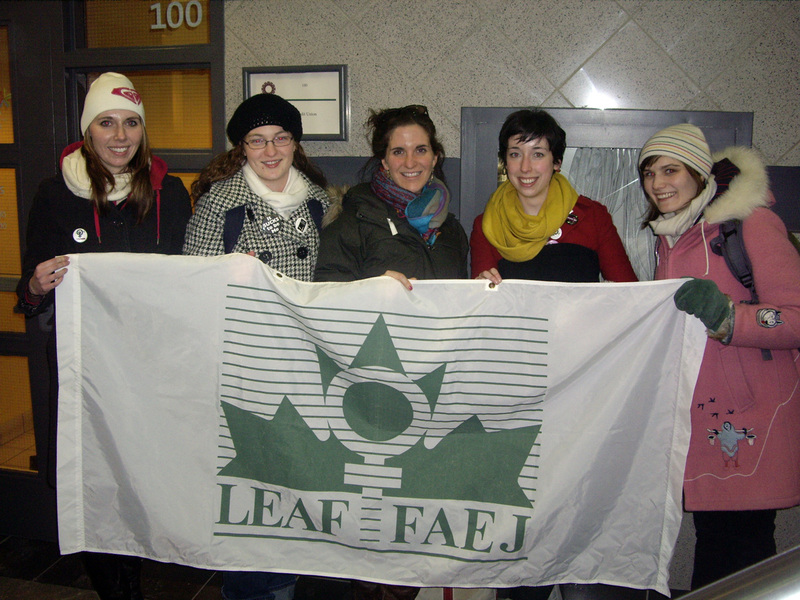 FLF members representing the FLF and LEAF Manitoba at the annual International Women’s Day March! IWD is a day for celebration. We’ve come a long way in 100 years. Its also pretty wonderful to take a day and just celebrate being women. But, its also a day to reflect on how much there still is to do, both here in Canada and also around the world. This article from the Globe and Mail is a beautiful and heart-wrenching look at how women experience life as women around the world. What can we do for them? What can we do here at home to move closer to true equality? This video questions whether men and women in developed countries really are equals. What do you think? We are so pleased that this roundtable with Dr. Emma Cunliffe (UBC, Law) has been re-scheduled for March 24th from 12 -1 in room 308. Don’t miss this opportunity to discuss the intersection of evidence law and feminism with an expert in the field. If you’d like to do some thinking in advance of the discussion, Dr. Cunliffe has suggested a short reading: What feminism can teach us about expert evidence. All students are welcome to attend – you do not have to have taken Evidence in order to enjoy and participate in this discussion.